Here's a cute pic of the kids just hanging out. I love it when they work together. 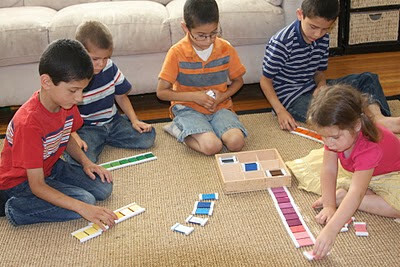 Even the older children who've already mastered the colored tablets, were enjoying spending time with the little one's. The older children taking joy and practicing patience in teaching the younger one's, and the younger children excited to be working with the materials alongside the old kids. I think it's sweet, and I feel blessed to be able to be a part of it, even if just as an observer.